Toyota unveiled its three-vehicle TRD Pro lineup for 2019 at the 2018 Chicago Auto Show. The Tundra and Tacoma pickup trucks and the 4Runner SUV will all once again be available in Toyota's most off-road-focused trim level. Changes to all three are mostly cosmetic; the mechanical bits that make all three so off-road capable don't include any notable upgrades or changes. 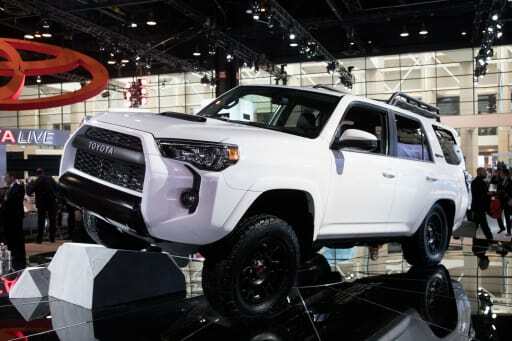 The biggest change is related to Toyota's commitment to standard safety features: All three models feature Toyota's Star Safety System, and the Tundra and Tacoma come standard with Toyota Safety Sense P.
TRD Pro models are available in Super White, Midnight Black Metallic or TRD Pro-exclusive Voodoo Blue. To the two trucks, shoppers can also add an available desert air intake (also known as a snorkel) that improves the vehicle's ability to draw clean, dry air into the Used Engines when driving on a dusty trail. The Tundra is available with new, lighter BBS wheels that reduce total unsprung weight by more than 13 pounds. Toyota altered the offsets of the wheels on the Tacoma and 4Runner to widen both front and rear tracks by 1 inch and increase stability. Check out our photos of all three off-roaders above, and stay tuned for more details on each — including pricing — as their on-sale dates in the fall approach.